At Future Vision Remodeling, we pride ourselves on being a family-owned and operated remodeling company specializing in custom design and building services. With over 14 years in the renovation industry we have established a business based on providing the highest standards of service using high-end designs and quality products. 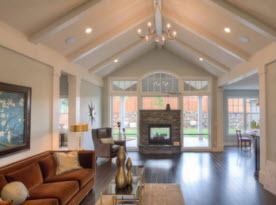 Our friendly and hardworking professionals consist of a design team, project manager, custom craftsman, and artisans who ensure that your project is completed on time and within budget. We will work with you to design and build the bathroom of your dreams. 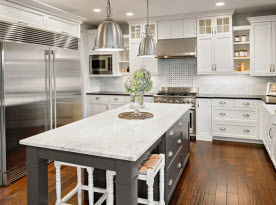 The experts at Future Vision Remodeling are well known in the industry for their attention to detail and craftsmanship; in fact we are the number one kitchen and bathroom remodeling company in San Jose, California and the surrounding areas. We can make your bathroom the envy of your friends and neighbors with our collection of custom bathtubs, shower surrounds, vanities, and much more. Your Future Vision Remodeling professional design team will utilize a specialized 3D design process to bring to life to your ideas and design inspirations. 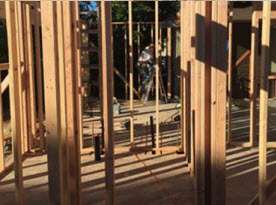 The process allows us to effortlessly reconfigure your shower, tub, vanities and other features to allow you to see your bathroom before construction begins. The process starts with a set of measurements which are then used to design a 3D model of your existing space. By using a 3D model, our design team can work effortless with our construction team to combine structure and design for a flawless finish. Your customized 3D design model will then be used to build your bathroom, utilizing premium quality products and materials to complete your home improvement project to the highest possible standards. No matter the size or scope of your home improvements, our team of professionals will handle your upgrade with the utmost precision and attention to detail. Your bathroom vanity, along with your selections of tile and fixtures are some of the most important elements when it comes to enhancing and decorating your bathroom. At Future Vision Remodeling, we offer a variety of options in real wood, stone, ceramic, porcelain and, glass including customized designs for all manner of bathroom styles and applications. Some of our most popular bathroom designs include Modern, Traditional, Rustic, Eclectic and more! Our designers are available to advice you on hardware selections and our installation specialists will take care of professionally installing your fixtures and plumbing. 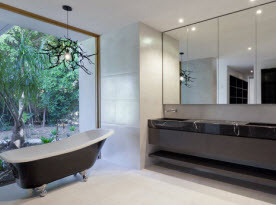 Modern: If you enjoy clean, simple lines combined with a space that is both functional and minimalistic then a modernistic inspired bathroom could be just what you are looking for. Pair sleek vessel sinks with concrete countertops and chrome fixtures for a bathroom that is the epitome of modern style. Traditional: A traditional bathroom is the perfect combination of rich chocolate cabinetry paired with copper fixtures, dark tiled flooring and the clean lines of subway tile. Additional design features include intricate crown molding and freestanding sinks to draw attention and add a focal point to the overall space. Rustic: If you love the look of raw or reclaimed wooden cabinetry and mirror frames combined with white porcelain sinks and other natural elements then rustic look inspired by an old farmhouse could be the perfect choice for your home. Eclectic: The definition of eclectic in the remodeling world is the mix and match of different styles and periods to create a unique and original design. For bathrooms, combine ornate mirrored frames, claw-footed tubs, and geometric tile patterns mixed with traditionally designed fixtures to create a vibrancy space that is also chic and unique. For more information regarding bathroom remodeling in Greater San Jose, California and the surrounding areas, contact the knowledgeable experts at Future Vision Remodeling today.